Are you confused about all those different health messages? Do you just want to find something that’s sustainable and really works? We’ve been there, too. Years of research and experimenting led us to a diet and lifestyle full of delicious meals that not only provided us with tons of energy but also eradicated all kinds of cravings and worries about our weight or health. With the help of plant-based foods, we said goodbye to crazy fads, digestive issues, and unwanted weight gain - and so can you! 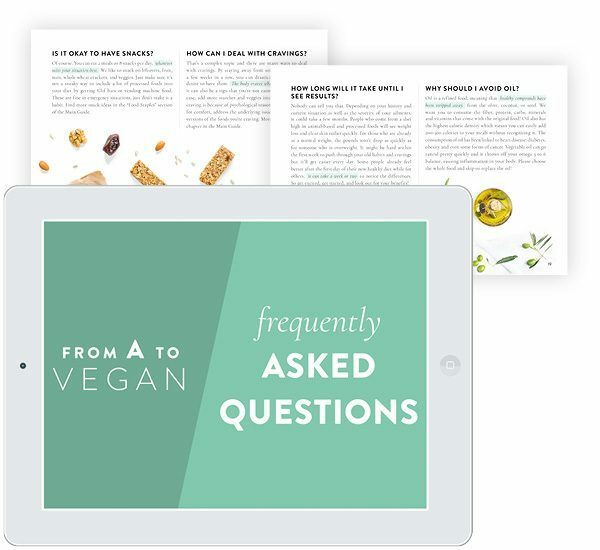 Our extensive 200+ pages guide covers all the background information you need to successfully hop on the plant-based lifestyle. 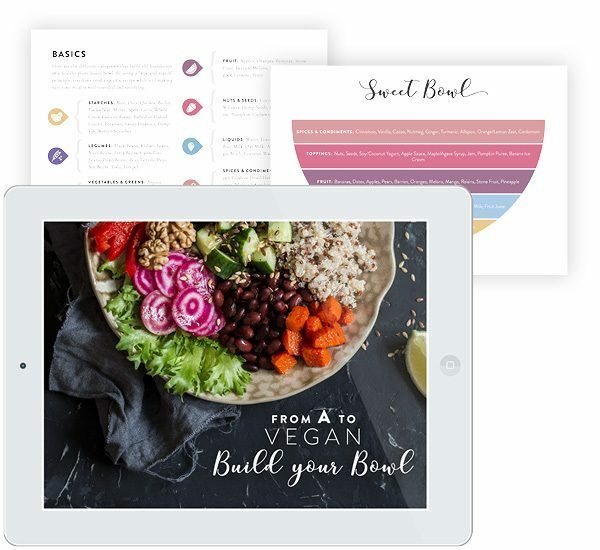 It shows how to meet all of your nutritional needs, what your portion sizes should look like, how you can set up your kitchen for success, what your new food staples are, and so much more. Find 40+ delicious and easy plant-based meal ideas in our accompanying recipe e-book. From quick breakfasts to filling lunches and extraordinary dinners, these recipes are real crowd-pleasers, don't require any fancy ingredients and will have you come back for more. Plus, they are totally free of oil or refined sugar! Put what you've learned into action by following our RD-approved 14-day meal plan including breakfast, lunch, dinner, and snacks. 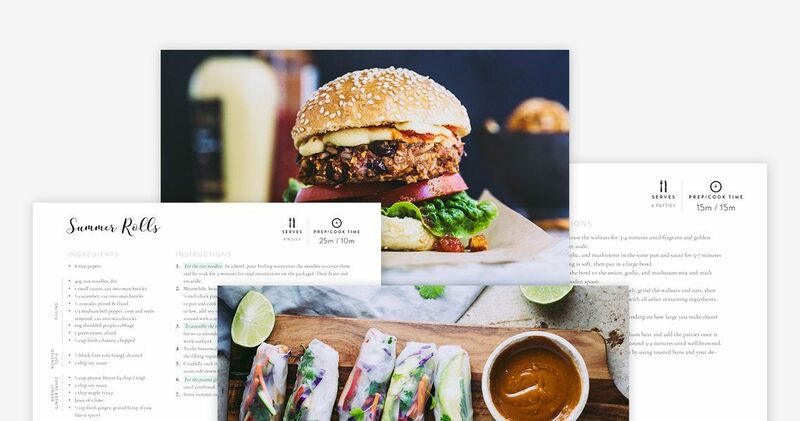 It comes with detailed shopping lists and is laid out for one adult person eating a nutritionally sound plant-based diet. You'll also find general meal planning and prepping tips here. 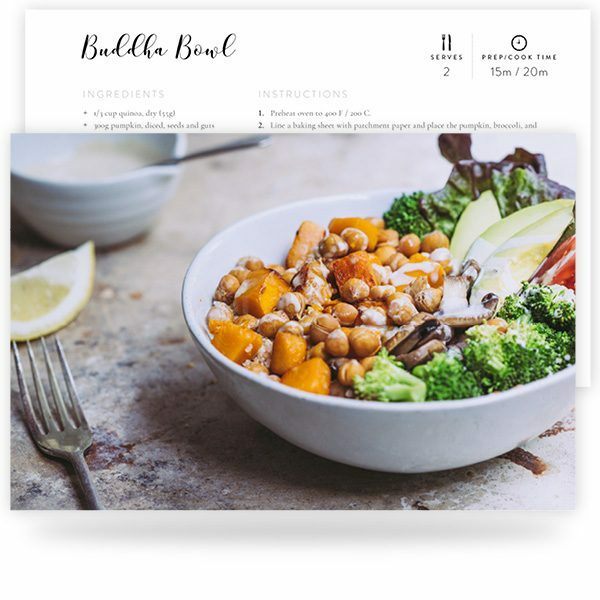 We also included simple formulas for building your own bowls so you don’t have to rely on recipes for every single meal you make! No matter your taste preferences, you can compose well-rounded meals using what you have at home. With our easy to understand formulas, a quick and delicious meal is just around the corner. Eating out can seem very daunting if you're on a plant-based diet. But there's no need to seek out purely vegan restaurants! In our well-structured restaurant guide, we show you how to eat out and find plant-based foods in unlikely places - even fast food joints. And we're not just talking plain lettuce here! 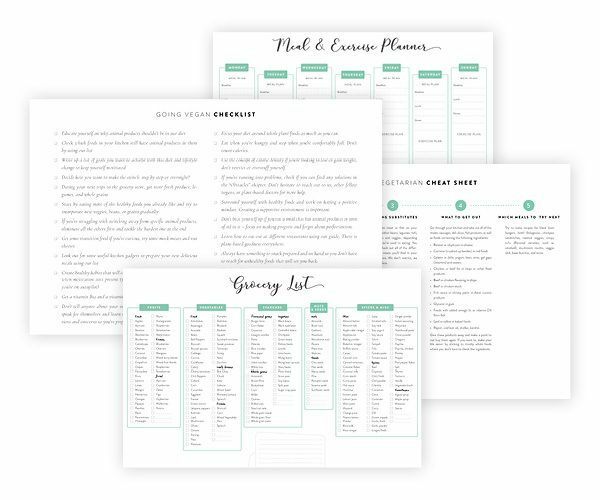 Finally, to make your transition to a whole foods plant-based diet very actionable, we condensed the most important information on a couple of cheat sheets, worksheets, and printables. You will also get a FAQ e-book concisely answering almost 50 of the most common questions around this lifestyle. Profit from our 10+ years combined experience and research! You don’t need to read a ton of books to gather all of this information - we distilled lots of knowledge from plant-based doctors and experts for you. The information is easy to digest, actionable, and beautifully designed so that you’ll be able to read through it pretty quickly. Educating yourself on the topics of veganism and nutrition is necessary to have a solid foundation of why and what you’re doing. We present the biggest & most important studies in an understandable & motivational way so you’ve got assurance and ammunition. Sometimes it seems so overwhelming to go from point A to point B. Especially when you don’t really know your destination! 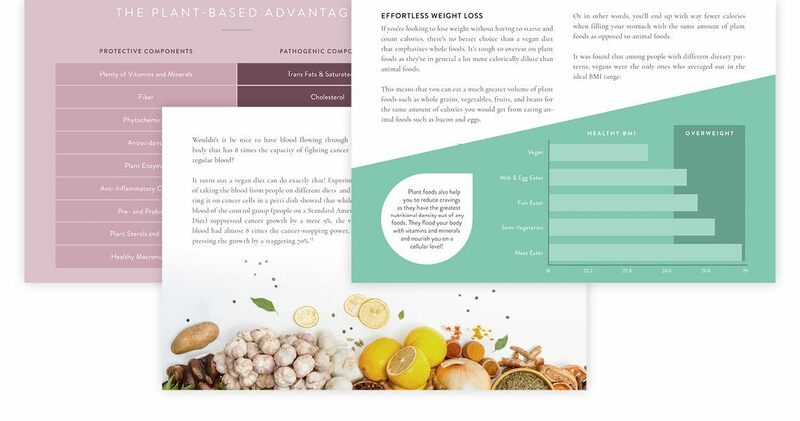 With our guide, there’s no more failing to make the switch to a plant-based diet – all the steps you’ll find are well-explained, easily applied, and lead you to success. Learn the keys to making this diet and lifestyle enjoyable and sustainable, no matter where you’re coming from! 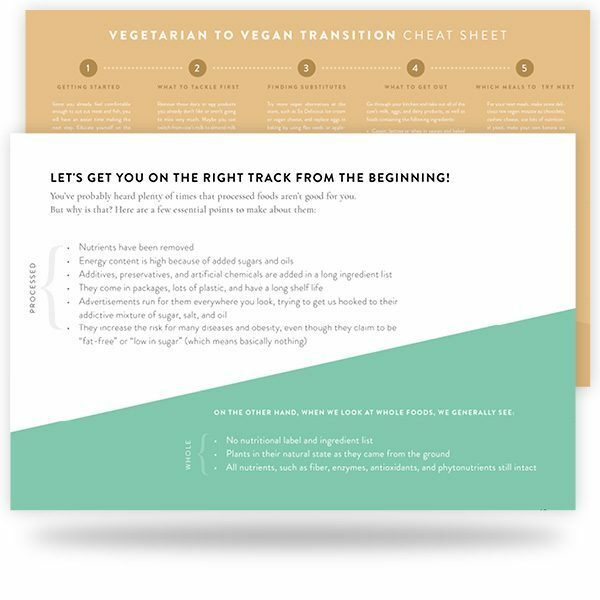 Use our transition guide and checklist for support and to make a healthy plant-based diet happen, easily and painlessly. This guide works even for those who are already vegan but don’t feel their best or struggle with staying consistent. 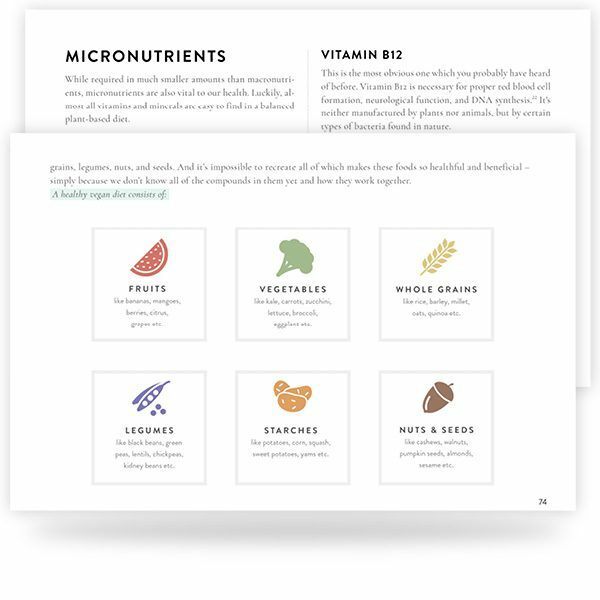 Find all of the critical nutrients, their recommended daily intake as well as their best plant-based sources in one place. No need to worry about percentages, protein intake, or food combining! Forget about crazy, unsustainable fad diets and go back to the roots. Plant-based eating is about an abundance of choices and doesn’t have to be restrictive! This isn’t a cleanse or a detox, it’s a sustainable way of eating and living. In our guide, you’ll learn how to read labels, navigate the grocery store, make easy food swaps, and much more. We want to see you thrive and become the healthiest version of yourself! Make your favorite and familiar meals as a whole food plant-based version using our recipe e-book. No matter if you’re into pasta dishes, pizza, Asian or Mexican cuisine – we have simple, nutritious and healthy recipes that cover all kinds of preferences. All of the recipes are without any added oil or refined sugar. Opt either for extravagant weekend meals or convenient concoctions – no craving will go unsatisfied. And with our complementary formulas to build your own bowls, you can just use what you have on hand without following strict recipes! It’s the fastest way to becoming a great freestyle chef. Despite all of the information we offer on how to eat on a plant-based diet, you might still want to get some additional structure in the beginning. We teamed up with a Vegan Registered Dietitian for this part of the Starter Kit to make sure everything is nutritionally sound. By following our meal plan for 14 days, you don't have to think about what to make for breakfast, lunch, and dinner in order to eat a well-rounded, delicious, and healthy vegan diet. We arranged it for one person and took time restrains during weekdays into account, offering quick lunches for busy people and more elaborate meals during the weekends. 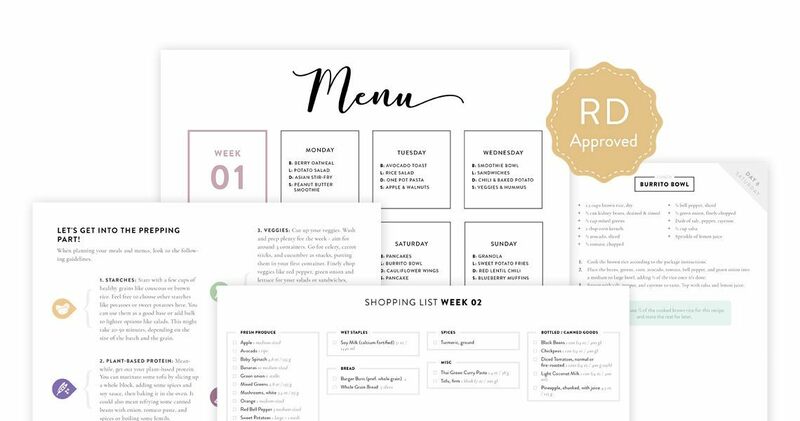 Of course, it all comes with detailed printable shopping lists for your weekly grocery shopping - don't worry, almost all ingredients will be easy to buy anywhere. 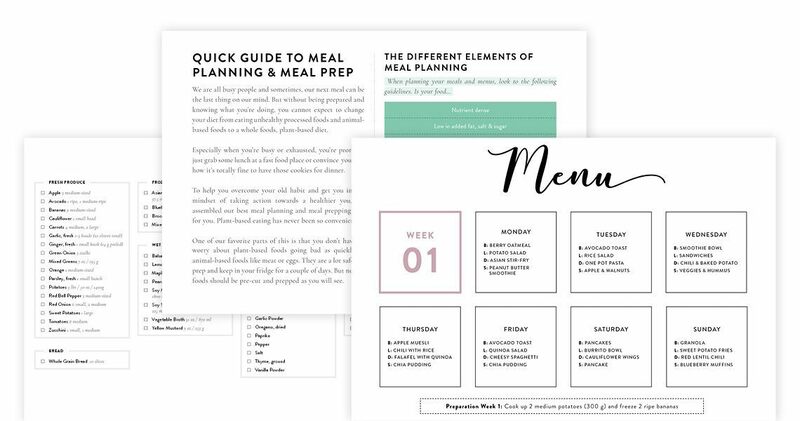 You can also find general meal planning and prepping tips here to easily create your own personalized meal plans in the future. Get to know the authors, their stories and reasons for creating ﻿﻿this guide. You’ll find out how to best use it, what our intention was, and how we came up with everything. We tell you what you can expect from changing your diet and life, how to put our tips into action, and what we will teach you in this guide. Starting with the basics here. We will share the definition of veganism, which areas it affects, and what vegans typically avoid. Most importantly, though, you will learn all of the important and compelling reasons for choosing a vegan lifestyle. Learn about the countless health benefits, “cruelty free” and “free range” labels, speciesism, the environmental impact, and the reality behind eggs and dairy products. Are human beings meant to eat an omnivorous diet or do we thrive on plants alone? And can we even get all of the important nutrients on a vegan diet? We get into the depths of these questions, show you the basics of healthy eating and getting adequate nutrition for all stages of life. Learn about protein, B12, calcium, soy, omega 3, the importance of whole foods, portion sizes, calories, and more here! Changing your diet successfully starts with changing your mindset. Let’s take a look at finding the right focus, your personal reasons for making this change, ongoing motivation, perfectionism, and how to create lasting habits. You’ll also find a step-by-step transition guide for all stages here. Then, we’ll clean out your kitchen, learn to read labels, make smart food swaps, stock up on healthy vegan food staples, and see how to navigate the grocery store. We all come across tough situations or objections to sticking to a plant-based diet. Find solutions to all the most common problems people come across, such as living on a tight budget, food cravings, digestive problems, finding good food outside of home, unwanted weight gain or weight loss, slipping up, bad cooking skills, having a busy schedule or an unsupportive family. We also address raw foods, intolerances, and possible health issues here. Health is more than just what we put into our bodies. In order for you to thrive on this lifestyle, we outlined some ways to de-stress, meeting your personal needs, finding balance between exercise and recovery, easy ways of getting more movement, and making sure you stay connected to supportive people in your life. You will also find DVD and book recommendations for further learning here. Finally, you’ll get a handy checklist, summarizing all the tips found in this guide! Master eating out as a vegan! Most places offer healthy plant-based options beyond just potato fries. Find out how to prepare for your next restaurant visit, which meals are automatically vegan in ethnic restaurants, how you can easily veganize different items on the menu and what hidden ingredients to look out for. We cover the most common fast food places as well as all kinds of different ethnic cuisines. Nobody wants to follow strict recipes every single day. One key to sticking to a plant-based diet is to learn how to create your own well-rounded and delicious meals! Find out how to re-think your plate and follow our easy formulas to come up with your own awesome concoctions. Healthy vegan meals are very simple and can be adapted to your taste preferences as well as what you happen to have in your fridge. Become an amazing freestyle chef! 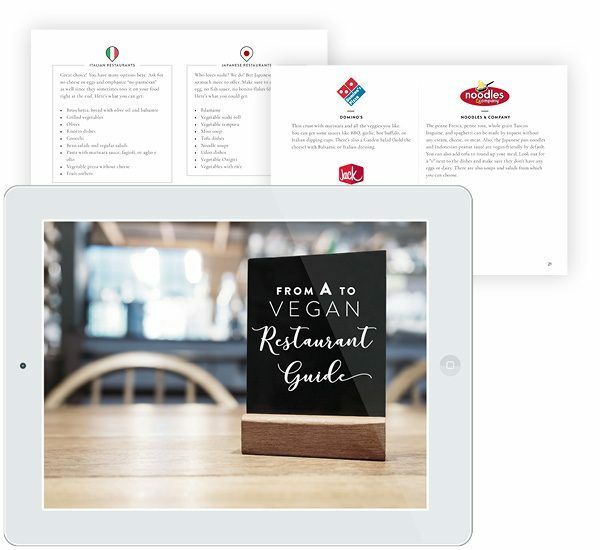 Even though we cover a lot of topics in our 200+ pages main guide, we wanted to include a separate e-book answering almost 50 of the most common questions in a short and sweet manner. This is your go-to place for remembering things like "Shouldn't I restrict carbs? ", "How can I deal with cravings? ", "Do I need to take supplements? ", and many more. Having shortcuts to success is what we all want. Even though this doesn’t get you around learning about the basics, using cheat sheets is very powerful in your everyday life. Some information can be pretty complex and having it broken down is what helps us memorize things and put them into action. Find your meal and exercise planner, an extensive grocery list, transition cheat sheets for your current dietary situation as well as a complete checklist of all the tips from the guide. All I have to say WOW. Lars and Alena have really hit it out of the park with this program. It is so extremely extensive, everything is laid out clear and concise. It's easy to read, and understand, and is jam-packed FULL of incredibly knowledgable, science-based information.This is the most comprehensive Vegan Guide, I have ever read, and I am blown away, because they literally haven't left ANY details out, when it comes to the 'how to's', and the 'what ifs'! I will happily share this program with all my friends/family and my audience, because this is something that every transitioning vegan, or vegan-curious, should read. It will answer all your questions, build your confidence in the vegan lifestyle, and have your taste buds exploding over the delicious recipes! Just wow. 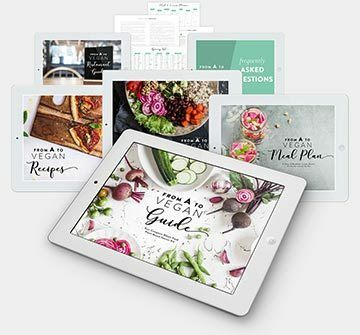 The content of this vegan guide is a full package, it covers all the most important topics, from ethics and environmental issues to scientific nutritional information. The pages are filled with wonderful and colorful pictures, this makes the reading really soothing and fun. The recipes are amazing, just looking at those meals makes my mouth water and makes me want to experiment in the kitchen straight away. I recommend this starter kit to everyone, this is literally a default way of eating and should be the standard diet of human beings today. Yesterday I completed the 14th day of your meal plan. This was honestly the best plan I've ever used! I have Hashimoto's Thyroiditis and PCOS. I've have ALWAYS had a difficult time losing weight. I LOST 5.5 lbs in 14 days! I was surprised to lose weight because prior to this I had been on a low calorie diet and the daily nutritional facts in the book showed I was eating almost double the calories from before. The meal planning tips were a great addition to the book. It helped me get into the mindset and into the plant-based rhythm. The recipes were great. Thank you for making them easy to make. A lot of plans have very complicated recipes with expensive or hard to find ingredients. I enjoyed being able to carry over ingredients throughout the meals. For the ﻿p﻿rice of ﻿e﻿ating ﻿o﻿ut twice, ﻿grab the entire Vegan Starter Kit now and take your first steps towards a healthy plant-based life today! If the Vegan Starter Kit isn't 100% a match for you, we also have other options. You could simply get the most important "action steps" from the Kit, which are the recipe ebook and meal plan, in a much smaller bundle. Or, why not pair the Vegan Starter Kit with our brand new Sustainable Weight Loss System? You can get it for 50% OFF ($18 instead of $37) in The Ultimate Bundle. Find what's inside the different combos below! No Risk for you - in case you don't like it! Our primary concern is to deliver you methods that actually do work in the long run and we are confident that you'll reach your health goals by following these guidelines. If for any reason you are not satisfied with your purchase, you may either ask us your questions via email and we'll address your concerns or simply request a refund and we'll return your money right away, no questions asked. Do I have to change overnight? Absolutely not. There are different ways of transitioning and we show you both the quick and slow way. Feel free to opt for vegetarianism first, using our transition checklist and going as far as you can at each moment. Do what you need to do in order to make this diet last. Is this a cleanse or detox program? Not in the traditional sense. This diet enables you to take out foods that harm your body and support your body’s ability to detoxify your system, but it isn’t a cleanse. In fact, you don’t need any exhausting or complicated cleanses when you just eat the right foods. Will I get weak when I cut out animal protein? As long as you eat the right amount of calories for your needs, you will be feeling amazing. There’s no shortage of protein in plant-based foods, you rather avoid a harmful overconsumption. Most people start to really thrive on a healthy vegan diet, so please don’t worry. Does the recipe book use weird and expensive ingredients? You might need to buy some food that you weren’t used to before, but definitely nothing too fancy or expensive. All the ingredients in our recipes can usually be found in normal grocery stores and are often the cheapest items of all. We’re talking about simple staples here. Will the meal plan be suitable for me? We created the meal plan together with a Registered Dietitian for a single adult person who needs around 2000 calories per day. If you’re overweight, you will lose weight following it, others will probably maintain their weight. Please listen to your hunger and feel free to skip the snacks or increase your portion sizes accordingly. We also included measurement conversion charts so that everyone around the world can easily follow the recipes. If you want to feed more people than just yourself, simply double or triple the amount of food. Will the books be readable on my iPhone/iPad/Android device? Yes they will. All of the 7 PDFs that we’ll send you will work on nearly every mobile device that can read these formats. 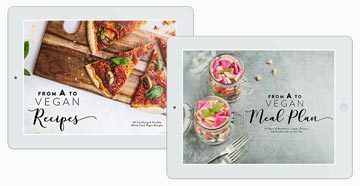 In many cases, mobile devices have preinstalled apps that can display PDF files – otherwise, we suggest using free apps such as iBooks for iOS. Feel free to shoot us an email if you run into any kind or trouble and we’ll be happy to help you out! After your payment is securely taken, you will immediately be forwarded to a download page. Additionally, you will receive an email containing a link to the download page. All links can be downloaded multiple times (in case you lose them or want them on different devices). Our system works 24/7, so you will receive instant access, even at 3 am! You can email us directly at mail [at] nutriciously [dot] com. We try to respond to all support requests within 1 business day (often within a few hours). We know how annoying it can be to always have to pay with a credit card online. This is why we also offer the option to pay with PayPal, where you will automatically be transferred to during the process. Your details are as safe as if you would use a credit card of course. We use secure SSL technology to safeguard your transaction. Also, we use industry leading payment technology from Stripe.com. At no point are your card details stored on our servers. They are stored securely by Stripe and ​all we have access to is your name, email and other order confirmation details. Your payment is as secure as it gets. 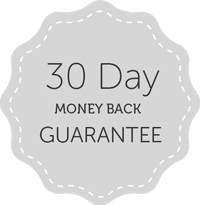 We offer all our customers a 30 days money back period. You can request a refund for any reason within that time, no questions asked! To request a refund, simply email us via mail [at] nutriciously [dot] com with your order number and we’ll process your refund right away. Hey, we are Lars and Alena - the couple behind nutriciously.com. After eating a plant-based diet for over 8 years, we decided to put together this comprehensive and actionable eBook bundle for anyone who's struggling to make a healthy vegan diet work. We've been on countless diet regimens, and it took us years of testing and studying to figure out what works best and what's backed by science. We have reached our optimal weight and healed a couple of annoying ailments by implementing the strategies we share in the e-books and our blog. We invite you to come along with us on your journey to a happier & healthier life!